The design stage is the starting point and where a lot of fun happens. Where possible we like to get together with our clients and throw a few cheeky ideas into the melting pot. After all, it's at this stage where we can incorporate all sorts of interesting features such as sand-blasted logos, raised or embossed text, coloured glass aggregates, integral wine coolers, pop-up TV's, built-in herb boxes, metal objects... the list is ENDLESS! We have a Pinterest page (look at the top right of the page for the fancy "P" and give it a click) where we collate loads of interesting ideas to whet your creative appetite! Everything we make starts with a mould. We can build a mould from a technical drawing, we can "template" from an existing installation or we can build from scratch. We're quite a versatile bunch. We use a variety of products and materials to build our moulds in our little factory and this is a particularly important part of the process. 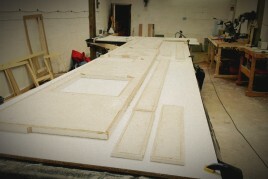 Every intricate detail we build into the mould will be reflected in the concrete product which comes out of it. Likewise every little defect (including dust!) can show up in the final product once it comes out of the mould. Accuracy is the key at this stage - we work within tolerances of +/-3mm! 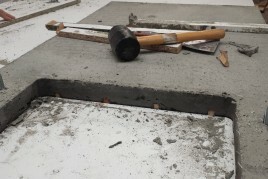 Our concrete contains a plethora of special additives and ingredients that are specifically designed to produce a type of concrete which is allows us to build up our moulds in layers so that the finished product is strong and durable and will not suffer from any warping or shrinkage. 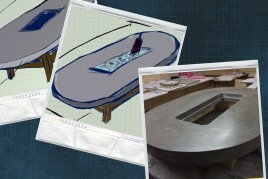 Once we have completed the casting stage, the concrete is left to cure for a couple of days. During this part of the process we cover the concrete to ensure that it remains warm and prevent moisture evaporating. It's very important that this stage isn't rushed as it ensures that the final product is as strong and as durable as possible. When the concrete has cured it's ready to be "demoulded". How do we know when the demoulding can take place? Ever heard of horse whisperers? We're the concrete equivalent! 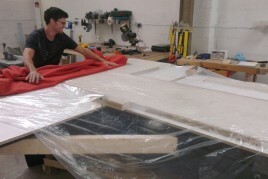 So as the name suggests, we strip the handmade mould from around the concrete so that it's ready to be polished up. Depending on the type and size of the project we either polish the concrete by hand or by using hand-held polishing machines. 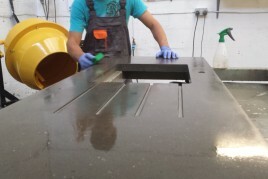 The aim during this part of the manufacture is to produce a finish which is smooth to the touch yet capable of providing a key for the sealer. The penultimate and possibly most intricate stage. We have spent many hours and many pounds testing an array of products. We've used vinegars, oils and citric juices and sadly wasted copious amounts of red wine to test these sealers. 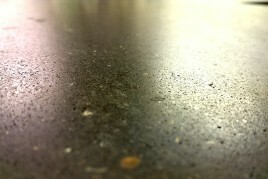 The sealers can take anything up to 3 days to apply - like the concrete itself the sealer also needs to cure. Once we are happy that the sealer combination has cured the finished product is ready to deliver to its final destination, but that is a separate story! 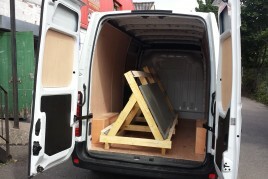 We offer an installation service whereby we will come along and install the finished product for you (obviously!) However if the client wishes, the products are always available for collection from our little factory.